A way to remember our studies. For the first project of the year, we created a presentation to go over a grammatical rule/concept we had learned before. But because I'm an honors student we created a presentation on a grammatical concept the rest of the class was about to learn. I was given the subject of informal commands and created a poster that I used as a visual aid during the presentation. 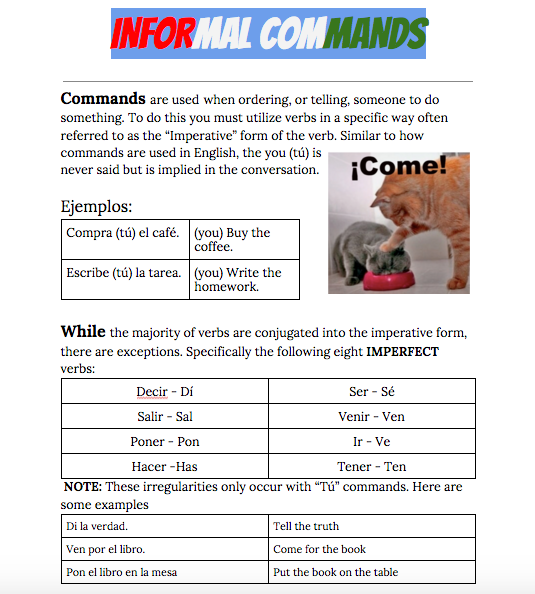 This is the poster I used to teach the class about the Spanish II concept of Informal Commands. The poster goes over the rules and applications of verbs within the commands and how to conjugate them correctly. For a regular informal command, you must conjugate the verb into its "Imperative" form and just continue onto the command. Remember, like in English, you must drop the (you) or (tú) from the command because it is already the implied in the conversation. There are eight exceptions though. These eight irregular verbs only occur in (Tú) commands and must be conjugated a different way. After explaining regular Informal commands, I went into NEGATIVE informal commands. 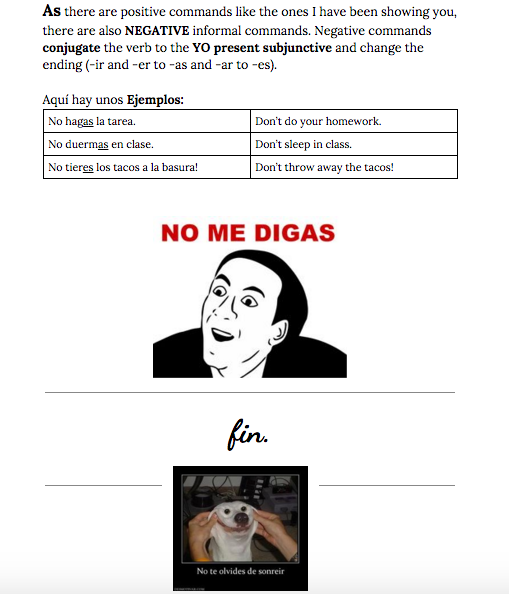 In a negative command, you conjugate the verb into the present subjunctive and add a "NO" before it. While teaching the lesson, I used memes as examples and a way of keeping the class entertained and invested in the lesson as a whole.